Figure 1 shows the LUMPAC module for converting files. 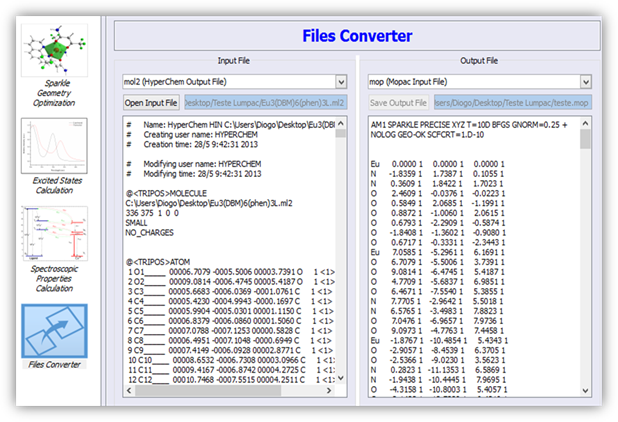 Table 1 lists all file conversions that LUMPAC can perform, each with a brief description. Table 1. File conversion that LUMPAC can perform. From MOL2, a MOPAC input file is created. This way, the process of geometry optimization can be directly performed by MOPAC. From MOPAC output file, a MOPAC input file is created, thus enabling any further calculations that depend on the optimized geometry. From MOPAC input file, an input for ORCA program is created. This way, the excited states calculation can be directly performed by using the ORCA program. From optimized coordinates using MOPAC, a file with the geometry in spherical coordinates is created. In this conversion the Ln3+ is considered the reference system. MOPAC output file is converted to a file with internal coordinates in order for the optimized coordinates to be visualized in other programs. File with the spectroscopic properties. The excited states calculated by the ORCA program are extracted. The .spec file contains the RL parameters. Figure 1. Module designed to file conversions to allow calculations using other computational chemistry softwares.